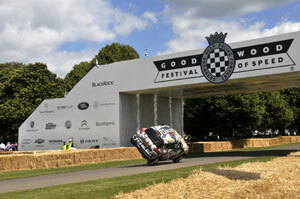 (07.08.2011, ROLLE, Switzerland) It wasn't the fastest time of the day, but when the Nissan JUKE took to the Goodwood Hill last weekend (1-3 July) it still managed to break a record. For JUKE, Nissan's fast selling new crossover, climbed the tortuous hill during the annual Festival of Speed on two wheels rather than four, to claim a new Guinness World Record by covering the one-mile course in 2 min 55 secs*. And to prove it wasn't a fluke, the JUKE - with stunt driver Terry Grant at the wheel -successfully completed the course no fewer than five times, sometimes with passengers on board. line is comparatively easy. 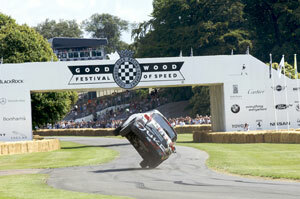 But the Goodwood course has corners, inclines and obstacles... there are trees and walls everywhere. I nearly rolled it on every run." To get JUKE onto two wheels, Grant used a ramp just ahead of the start line before heading towards Goodwood House and the first corner, a near 90-degree right. "That was where it started getting tricky. I had to tease it round, knowing that if I turned the wheel too far - or touched the grass - I'd be on the roof. Not enough and it would fall back onto all four wheels," said Grant. But worse was to come. One of the most famous obstacles on the course is a stout flint wall towards the end of the course and which juts onto the track. "Driving on two wheels is like driving with one hand over your left eye and another hand obscuring half the right - from where I was, tucked down on the right of the car, all I could see was the bonnet of the car and a bit of sky. I couldn't see where the wall was at all." The stunt captured the imagination of the huge crowds who were clapping and cheering all the way up the hill, while even hard-bitten journalists watching the run on monitors in the event's media centre were willing him on. Not content with driving JUKE solo, Grant also took passengers on three of the runs. "I had circuit commentator Amanda Stretton on one run, complete with 12 on-board cameras. I also took Lewis Hamilton's father Anthony up the hill - both Amanda and Anthony sat in the back on their runs. "But the most difficult was on the Sunday when I took Aussie motorcycle stunt rider Robbie Maddison up. Robbie was in the front, half out of the car and waving to the crowds all the way up!" 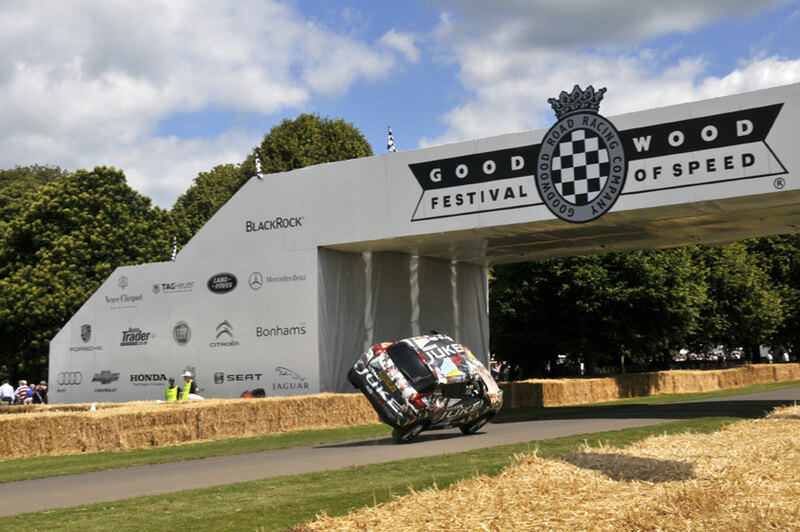 After electrifying the Festival of Speed, Grant and the Nissan team then decamped to the nearby Goodwood race circuit and set about another dare-devil stunt, this time by lapping the track in the all-electric Nissan LEAF. In reverse. Because the EV doesn't have a conventional transmission it can, in theory, travel as fast backwards as it can forwards. On his fastest lap Nissan LEAF peaked at 62mph (100km/h). Going forwards it will reach 90mph (145km/h) suggesting that there might be more to come. Nissan has confirmed it is looking at future record attempts. Terry Grant said: "Driving backwards at those speeds is very tricky. You have to be super smooth at all times: any sudden movement of the steering wheel can have disastrous consequences." For the moment, though the only problem associated with Nissan's week of record breaking has befallen driver Terry Grant. After spending the weekend on two wheels and the early part of the week driving backwards, Grant confess that his neck now feels a little stiff!